Omg – I finished it! Long, complex and puzzle-oriented, Quincunx is the much lauded debut novel by Charles Palliser which was published first in 1989 but has maintained some of its popularity. I read it because I very much enjoyed Palliser’s 2013 novel, Rustication in January of this year. 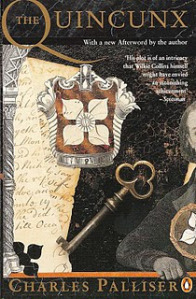 Quincunx is basically a Dickens parody informed by the post-modern interests of Palliser’s own day. That means the setting(s), twisted and complex plot lines (often concerning the underworld of London in the Victorian era) characters types, etc. are heavy with the standard Dickensian flavor, if not outright mimicry. Palliser made an excellent job of it. In brief – Johnnie Mellamphy lives in hiding with his mother because she says there are people after them. She has the codicil to a will which favors her and there are people who want her dead – people who have killed others, who have cheated and abused people – so Mary wants to simply stay hidden. They are burgled. She will not sell the codicil although it could resolve their financial difficulties. John meets the girl next door, Henrietta, discovers that his name is not all it should be and wonders who his father is. John is kidnapped. He and his mother move to cheaper and cheaper housing until finally they are in the poor house, a work-farm, an asylum, working in the sewers and more. This gets grim. This is not Dickens. As the tale goes on – and on and on – more is revealed bit by bit. Stuff happens and Johnnie figures it out – explains it to us. Big chunks of the family tree and history, including wills, debts, marriages, births and deaths are revealed very slowly – sometimes the wrong conclusions are drawn, friends turn out to be working for enemies. There are people who will inherit quite a lot if Johnnie and his mother are dead. There are others who want to keep them alive. There are alliances and back-stabbing. The poor are not necessarily better morally. The title comes from the shape of 5 symbols – dominoes or trees or playing cards – a square of symbols with another one in the middle of the five. The book is divided into 5 “Parts” of 5 “Books” each and 5 chapters to each book. The “five” is repeated in various ways from a the family names and their crests to a name, Pentecost, to a code for a safe, to the design of a group of trees. Many of the large number of characters are almost interchangeable – most are baddies, we have to trust that Johnnie and Henrietta are not, but … there is a very helpful “Index of Characters” at the back of the book. There are family trees as the book progresses – each one filling in a bit more – focusing on one of the five families or not. But in the end it’s a post-modern take on Dickensian fiction – I appreciated it on that level but also as a really cozy read of door-stopper size.